Arthritis is wear & tear of the knee joint. Knee replacement is a good option to relieve pain. There are specific indications when only part of the knee may be replaced. This may be the knee cap joint or “Patello-femoral replacement”, Just the inner part of the knee joint or “Medial uni-compartmental knee replacement” or just the outer side of the knee when it is called the “Lateral uni-compartmental knee replacement” These operations are indicated when only these parts of the knee are affected by arthritis & the rest of the knee is completely unaffected. 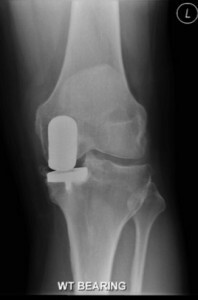 Advantages of partial knee replacements are that they are less invasive operations & rehabilitation is quicker but have a four times higher re-do or revision rate compared to a Total knee replacement.